When Jughead's beloved pet, Hotdog, is hit by a car and killed, Jughead goes to Sabrina the teenage witch for help. Sabrina's aunts say that there is nothing to be done, but Sabrina helps Jughead anyway and raises Hotdog from the dead. Sabrina's act of kindness has horrific consequences, causing Hotdog to reanimate as a zombie and bite Jughead. The newly undead Jughead then crashes the Riverdale High school Halloween dance, attacking his fellow students and changing Riverdale forever. I haven't read the recent Life With Archie comics, so I can't compare this with those, but Riverdale seems to have changed a bit since the Archie comics I read as a kid. It's been shifted forward in time and there a few other changes to the people of Riverdale. There are gay and lesbian characters and what seems to be an incestuous relationship between the Blossom kids, something which if it was there in the old comics I certainly never picked up on. Overall, however, Riverdale still retains the wholesomeness and sense of security and warmth it always had... Right up until the zombies attack. The art, by Eisner Award winner Francesco Francavilla (The Black Beetle, Guardians of the Galaxy) is beautifully atmospheric, with lots of sillouettes and stark outlines, using only a limited colour palatte (mostly red, purple and orange). The story is by Harvey award winning writer Roberto Aguirre-Sacasa (Carrie, Archie Meets Glee), who doesn't pull any punches. Major characters die (sometimes more than once), and town icons are destroyed. Seeing Riverdale come to this is a little like having zombies kill off the cast of Seasame Street (which, admittedly, I would totally watch). It sends a message that if this could happen in Riverdale then nothing is sacred and no-one is safe. And horrifying as that is, you can't help but watch with fascination as it's all torn down, to see what might appear in its place. 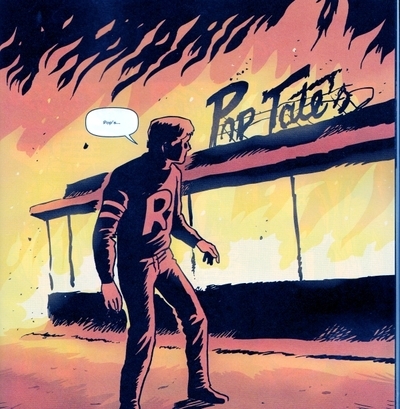 Afterlife with Archie has gripping storylines, witty dialogue and spooky art. It's great gruesome fun, recommended for Archie fans and lovers of zombie stories. 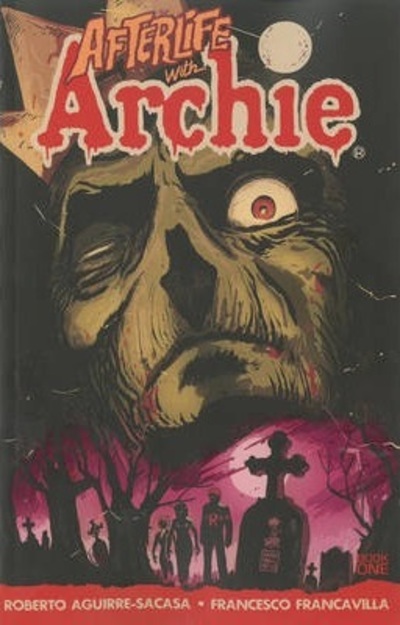 Afterlife with Archie Volume 2: Betty R.I.P will be out in September 2015. I like this article in that it convinces me never to read it and just keep good memories of the Archie comics of 60 years ago.